"Hakone Reigen Izari no Adauchi" was written for the puppet theater and staged in the 8th lunar month of 1801. It was immediately adapted for Kabuki and staged in 9th lunar month of 1801 in Kyôto at the Kitagawa no Shibai [casting]. It was revised by Segawa Jokô II and staged for the first time in Edo, in the 7th lunar month of 1808 at the Nakamuraza [casting]. The title of this revision was "Zôho Izari no Adauchi". This play was based on a real event: the revenge of Iinuma Hatsugorô, who killed Katô Kôsuke, the murderer of Hatsugorô's brother, the 21st of January 1590. "Hakone Reigen Izari no Adauchi" was originally made up of 12 acts. The 11th act, which is made up of two scenes, is still part of the current Kabuki repertoire. The first scene, the "Amidaji Temple", lasts between 60 and 70 minutes. The second scene, "the Shirataki Waterfall", lasts less than 20 minutes. Iinuma Sanpei, the elder brother of Iinuma Katsugorô, was killed by the villain Satô Gôsuke. Katsugorô has sowrn to take revenge and kill Gôsuke. His long quest led him to the mansion of Tsukumo Shinzaemon, where he became retainer and fell in love with Shinzaemon's daughter Hatsuhana. Shinzaemon agreed to their wedding and the newly-weds decided to run together after Gôsuke, disguised as a couple of beggars. They were helped by Fudesuke, the brother of Hatsuhana. Katsugorô fell ill on the road and unfortunately lost the use of his legs. Katsugorô is crippled and Hatsuhana pulls him along in a wooden cart. They walk a long way to Hakone, where lives their enemy, who has changed his name to Takiguchi Kôzuke and has joined the Hôjô clan. They confront their mortal enemy in the Temple of Amidaji, where beggars can receive alms from the Hôjô clan members. He captures Hatsuhana's mother Sawarabi and takes pleasure in humiliating Katsugorô. Katsugorô, who has suffered many years in search of Gôsuke, limps out of his cart, seizing the hilt of his katana and looking fiercely at his enemy. The opportunity of revenge has come but the crippled Katsugorô is powerless against the villain, whose power is at his peak. Gôsuke cooly smokes his pipe at his ease and leisure. Then, he offers a deal to Katsugorô: he will spare his life if Katsugorô gives him his wife Hatsuhana. Gôsuke leaves with Hatsuhana. 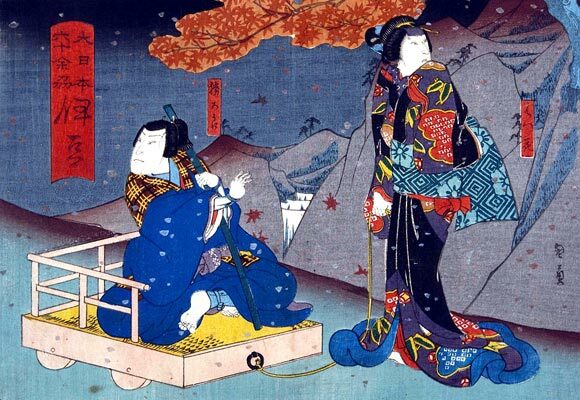 Hatsuhana returns and goes to the sacred waterfall of Tô-no-Zawa, where she prays within the extremely cold water for the recovery of her husband. By some miracle, Hatsuhana's prayers are answered and Katsugorô suddenly recovers the use of his legs, while Hatsuhana mysteriously vanishes! Fudesuke arrives at the scene of the miracle, bringing with him the head of Hatsuhana, who has resisted Gôsuke's will and was beheaded by the villain. Everybody understands that the woman who prayed in the waterfall was none other than the ghost of the faithful Hatsuhana. Katsugorô and Fudesuke win out over Gôsuke, avenging the murders of Katsugorô's brothers Sanpei and Katsugorô's wife Hatsuhana.